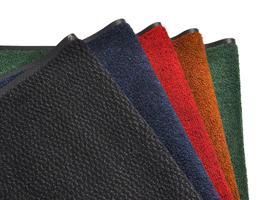 Stop dirt in its tracks and keep it out of your healthcare facility with the right choice of entrance mats only from MEDtegrity! MEDtegrity is your leading provider of professional cleaning solutions and products designed to help make cleaning and managing your facilities so much easier and more efficient. We have combined our excellent selection of commercial floor mats with our unmatched expertise in mat cleaning services to provide you with the most outstanding floor mat rental service designed for your industry. Features high-performance backing material that provides much-needed additional traction, helping prevent slip-and-fall accidents in your facility. This protects both your patients and staff from injuries attributed to these accidents. MEDtegrity schedules regular and on-time pick-up of your used medical mats for proper, hygienic treatment at our facilities. We use the best of our cleaning technology and our industry expertise to bring you the cleanest mats for your facility. Available in a variety of colors and sizes to suit your existing aesthetics and preferences. There are many companies that provide medical mats and rental services. They make so many promises about the integrity and quality of their products and services – but nothing can quite deliver as excellently as MEDtegrity does. MEDtegrity specializes in the product and service needs of medical healthcare facilities of all sizes. As such, we are experts in the unique hygiene needs of the industry. We use topnotch technologies in our facilities to cater to these requirements for all our services, including our entrance mat rental services. On top of our superior system that guards against the spread of infections in healthcare facilities, we have also designed our services to be efficient and convenient. We abide by One Agreement for all services across all our locations, One Contact person to address all of your concerns, and One Invoice option that makes billing for multiple accounts and branches easy and completely hassle-free. For mat rental services made to suit the needs of the healthcare industry, contact MEDtegrity today! Call 888-893-3334 to speak with one of our experts!